"A small day pack can carry all you need to stave off a bad outcome in the outdoors, says hiking-safety expert Robert Speik"
On Monday, a climber died atop Mount Rainier in Washington, and another two had to be rescued. This past weekend, a man was rescued near Sparks Lake, and a hiker had to be plucked off Mount Hood by helicopter. As the summer weather approaches, more people are heading into the mountains, forests, and trails. But a simple day trip can quickly turn into a rescue. Snow-covered mountains, lava rock caves and steep canyon trails. At NewsChannel 21, we've reported on dozens of rescues this year alone. Some people lost, others hurt, all in need of help. "The weather gets a little bit better, they get out there and think, 'Oh I'm just going to go on a day hike,'" said Deschutes County sheriff's Sgt. Marvin Combs. "And when they go they don't take any equipment, they don't take compasses, they don't tell anyone where they're going - they're not prepared." Even when you're not planning on being gone long, a quick trip can turn deadly even for the most experienced people in the outdoors. "You've lived here your whole life, you've been out to the area a hundred times, you think, 'It's not going to happen to me.' Well, it can happen to you," Combs added. Robert Speik of Bend runs www.traditionalmountaineering.org, and has been giving hiker safety classes for more than 14 years. 1. Tell someone where you're going, your itinerary, and when you plan to return, and stick to your plan. 2. Bring extra supplies, including clothing, food, medical supplies and shelter systems. 3. Have a map of the area, a compass and a GPS device. 4. Bring a cell phone. "The central theme of everyone who is lost is that they didn't plan to be lost. They never thought they'd become lost," Speik said. His lightweight day pack is filled with clothing for all kinds of weather, food, GPS systems and smaller items, like medicine and toilet paper. "Six or seven pounds will keep you comfortable all night," Speik said. "And if you don't have those things, you can die." Deschutes County Search and Rescue gets roughly 90 calls a year. Each can require hours of planning, calling in volunteers, and sending out equipment. "We never know going in if we're going in if we're going to be there for a short two-hour period, to several days or several weeks," Combs explained. Still, the team would much rather go on a rescue than a recovery. Regardless of your outdoor plans, there are dozens of tips available online that can literally save your life this summer. Robert Speik will be holding his next class on Saturday. To sign up, or for more detailed safety tips, go to www.traditionalmountaineering.org. Check ktvz.com for this segment! 1. Tell a Reliable Person where you are going, what you are going to do and when you will return. Search and Rescue personnel will want to know where you planned to park your vehicle, its description and license number, what gear you have, the names, cell phone information and experience level of your companions. Of course, you must agree that you will call the Reliable Person when you return to town. Also, this encourages your thoughtful setting of a "turn-around" time for your adventure. The Reliable Person must accept the responsibility to call the local County Sheriff’s Search and Rescue through 911 with the above information if you do not check in by an agreed-upon time. Your life may depend on a timely call to 911. Oregon Statutes require that you have left this information or you could be charged up to $500 per person for Sheriff’s Search and Rescue services. Experience tells us that the Reliable Person may not understand the importance of this responsibility. 2. The Second Responsibility of each individual backcountry traveler or climber is to be prepared with a light weight daypack and enough extra clothing, water, food and selected gear to survive an emergency stop of several hours or overnight. These Essentials are seasonal and should focus on keeping you warm and dry, hydrated, eating simple carbohydrates, and able to stay in one place. If you become lost, signal your location, perhaps with colored tape or a reflective "plastic 9 ounce bivy sac", and stay still or exercise your large muscles at your marked position to stay warm. Do not try to find your way until you become exhausted, cold or dangerously wet. Wait at your marked location safely for rescuers. If you are not “prepared”, you could be charged up to $500 in Oregon for Sheriff’s rescue services. Experienced mountaineers carry the traditional "Ten Essential Systems". 3. The Third Responsibility is to have a topo map of the area, a declination corrected base plate compass (seventeen degrees currently in Central Oregon) and an inexpensive GPS that provides your coordinates. A small simple accurate Garmin eTrex H GPS receiver costs only about $100 everywhere, a simple base plate compass $35 and a 1:24,000 USGS Quad topo map, $7, total $137. If you do not have a “topo map and compass”, you could be charged up to $500 per person for Sheriff’s rescue services. Experience tells us that you cannot get by with GPS alone – you need a topo map and declination adjusted base plate compass, and new skills to use them together! Insure that you have the personal option to call for medical or rescue services. I would prefer to call for help on Friday morning at the time my leg was broken and not have to wait until Sunday at 6PM when I will be reported missing by my Responsible Person. In our experience, there are very few areas in our Oregon Cascades where a cell phone is out of contact. Several cell phones in a group are far better than one. Phone rescuers on your cell phone with your exact UTM (NAD 27) GPS coordinates, your current condition and proposed plans. An important new free service is the ability of Rescuers to request from your mobile phone Provider, your general location triangulated from cell phone "ping" records or from a GPS chip in some new phones. Another option for many is to carry a $150 SPOT Satellite Messenger which can give your friends and/or 911 your exact GPS location. 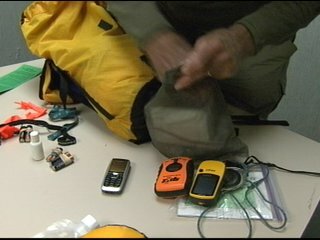 Oregon SAR Statutes require that you carry a means of communication such as a cell phone. Carry a personal cell phone turned on and positioned where it can best stay (warm and) in contact with the cell phone towers. Copyright© 1995-2008 by Robert Speik. All Rights Reserved. 401.590 Reimbursement of public body for search and rescue by benefited persons; amount; exceptions. (1) A public body may collect an amount specified in this section as reimbursement for the cost of search and rescue activities when the public body conducts search and rescue activities for the benefit of hikers, climbers, hunters and other users of wilderness areas or unpopulated forested or mountainous recreational areas in this state. (2) The public body may collect moneys as authorized by this section from each person for whose benefit search and rescue activities are conducted. The public body may not collect more than $500 from an individual under this section and may not collect more than the actual cost of the search and rescue activities from all of the individuals for whose benefit the activities are conducted. (b) Applicable laws were violated by such individuals. (4) Any individual who is charged a fee for reimbursement under this section may appeal the charge or the amount of the fee to the public body that charged the fee. (a) The individuals possessed experience and used equipment that was appropriate for the known conditions of weather and terrain. (b) The individuals used or attempted to use locating devices or cellular telephones when appropriate. (c) The individuals notified responsible persons or organizations of the expected time of departure and the expected time of return and the planned location or route of activity. (d) The individuals had maps and orienteering equipment and used trails or other routes that were appropriate for the conditions. Note: 401.590 was enacted into law by the Legislative Assembly but was not added to or made a part of ORS chapter 401 or any series therein by legislative action. See Preface to Oregon Revised Statutes for further explanation. (1) “Electronic signaling device” includes, but is not limited to, a system consisting of an instrument which emits a radio signal, designed to be carried on the person, an instrument for locating the source of such signal, designed to be utilized by searchers and such instruments as may be employed for testing and maintaining the same. (2) “Inherent risks of wilderness travel and mountain climbing” includes, but is not limited to, those dangers or conditions, the risk of which is an integral part of these activities, such as becoming lost, incapacitated or for some other reason being unable to return safely without outside assistance. “Inherent risks” include the activities associated with search and rescue, due to the unpredictable circumstances under which search and rescue operations are conducted. Note: 401.605 to 401.635 were enacted into law by the Legislative Assembly but were not added to or made a part of ORS chapter 401 or any series therein by legislative action. See Preface to Oregon Revised Statutes for further explanation. 401.615 Assumption of risk of wilderness travel or mountain climbing; use and effect of signal devices. (1) In accordance with ORS 31.600 and notwithstanding ORS 31.620 (2), an individual who engages in wilderness travel or mountain climbing accepts and assumes the inherent risks of wilderness travel or mountain climbing. Note: See note under 401.605. Note: See "note" under 401.605. What do you carry in your summer day pack? Photos?